L'Oréal Professionnel Mythic Oil Masque for Normal to Fine Hair is inspired by the tradition of ancient Egyptian queens’ oil layering for healthy looking hair. The Mythic Oil Masque is concentrated with ginger essential oil, bringing tonicity and the look of vitality to the fibre. 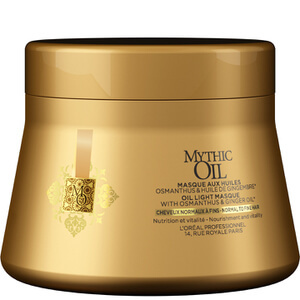 The treatment is also infused with osmanthus extract, renowned for deeply caring and providing suppleness to hair. The creamy mask makes the hair easy to comb and leaves hair looking nourished. Apply 15-20g of the mask from the mid-lengths to the tips of damp, shampooed hair. Leave for three minutes. Rinse thoroughly. For a little extra treat, apply from root to tip in the evening and wash out the following morning.